Between nine and twenty-two thousand years ago Mojave Lake, a large body of fresh water, stretched north to south from Silver Lake to the Kelso Dunes and from the mouth of the Mojave River east to the Cow Hole hills and covered some 90,000 acres of desert. This region was much cooler during that period. Melted snow from the San Bernardino Mountains flowed continuously down the Mojave River and local rainfall fed in from the surrounding mountain ranges. 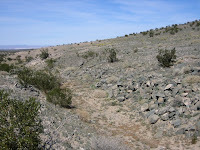 The inflow to Lake Mojave substantially exceeded evaporation expanding the basin until the excess water spilt through the lowest point and flowed due north merging with the Armagosa River that emptied into Death Valley. At its peek, the surface of the lake topped 40 feet above the current desert floor at the north end and was five to ten feet higher at the south end of Soda Lake. If the lake were there today the small town of Baker, would be under 20 feet of water. The 1919 photo on the left shows the shore line (white rocks) in relation to present surface of Silver Lake -- quite a drop. 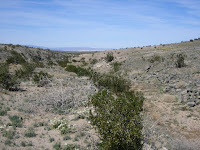 The 1917 photo on the right is taken from the Mojave River exit looking east across the south end of Soda Lake. According to the experts, the region became warmer and dryer causing the lake to slowly disappear leaving behind Silver and Soda lake beds that are dry except in years of exceptionally heavy rainfall and snow in the San Bernardino Mountains. Over time, as the outbound water flowed through the narrow channel, the top layer of soft conglomerate material eroded or washed away increasing the outflow and lowering the level of the lake a few feet. Evidence of this can be seen at the narrows or gap where layers of the soft conglomerate material are exposed above a granite base rock. The elevation of these layers is consistent with corresponding beach lines at the edge of Silver Lake. In 1916, flood waters engulfed the small community of Silver Lake that lies two miles south of the channel at the edge of the lake. The flood waters also covered the rails and berm of the Tonapah and Tidewater (T&T) Railroad that ran up the center of the playa. Buildings were raised and moved across to a location on the east side of Highway 129. The rails were also moved to the east. Railroad crews cut a trench from the lake to the channel gap in an attempt to pump the water through the gap and into the old channel. The attempt failed. The trench is still visible in places. Silver Lake was the most active settlement in this part of the desert from 1906 to 1916. The construction of Highway 91 (now I-15) caused businesses to move to Baker and signaled the end. The Silver Lake Station on the T&T line remained active until sometime in the 30s and the rails were removed during WWII. A friend and I visited Silver Lake a few months ago and took some pictures looking north up the channel standing above the gap. To get there: Drive north on Highway 129 to the power line road that crosses the highway about nine miles north of Baker. Drive west ¼ of a mile on the power line road and park. Walk due north 1/3 of a mile to the gap. The channel is not visible from the road and it’s pretty easy to miss, however, if you find and follow the trench that was dug by the railroad crew you’ll be headed the right way.